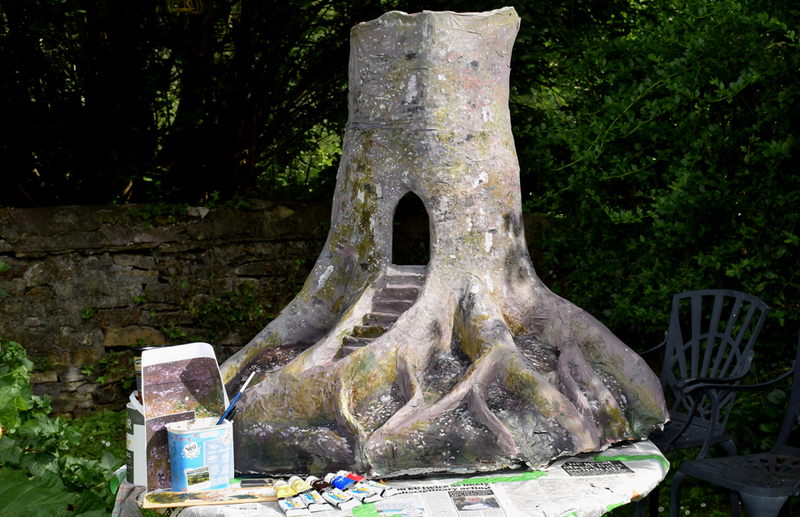 Completed putting the paint on my ‘Fairy Tree’ prop, to be used in the planned model shoot at the end of July. Now it requires a little door and some windows. It is made from paper mache (torn newspaper strips dipped in the simplest flour and water paste mix), laid over a chicken wire frame. I used a few acrylics paints, and based the bark pattern on a Beech tree that I photographed in some nearby woods. Considering that I have not made anything in paper mache for more than 10 years, I was quite pleased with the result. However, it is just a prop, and so was never required to be perfect, as many details can be altered when I come to the picture painting stage. Will I get more than one or two paintings made from this? I hope so, but only time will tell. Next postFairy Photoshoot in Exeter – Monday, 31st. July, 2017.